White Rice flour or brown rice flour is commonly used in gluten-free baking. It has a neutral flavor and white color, can be digested easily, and is considered hypoallergenic.1 Gluten-free dough made with rice flour will resemble a batter more than a dough. Rice flour is used as an alternative to wheat flour in gluten-free baked goods. Bread produced from it may have lower loaf volume, harder texture, and shorter shelf life.1 It is important to use it in combination with other flours, starches, gums, and enzymes to help mimic the gluten matrix. Rice flour is high in fiber, gluten-free, and low in saturated fat, cholesterol, and sodium. 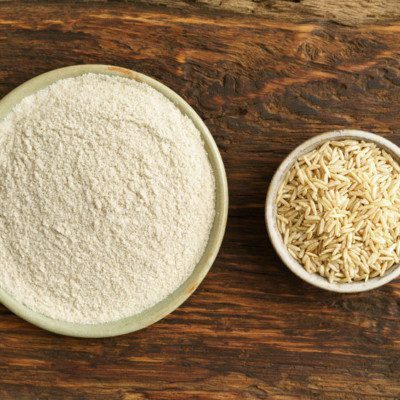 It has less nutritional value than whole-grain rice or whole grain brown rice flour) but is a significant source of manganese.4 It has around 7–10% protein, 75–82% carbohydrates, and .7–1% fat.4 Rice flour is enriched with vitamins and minerals to meet nutrient requirements. Wet grinding is the most traditional – and the most expensive – process for obtaining rice flour. Wet grinding results in significantly smaller average particle size and a lower percentage of starch damaged starch than alternative grinding methods. Semi-dry grinding is simpler than the wet grinding method. Rice kernels are soaked and dried before they are grinded into flour. The method is expensive and time-consuming. Dry grinding is done without any prior soaking of the rice kernels. The kernels are ground using varying tools (e.g., hammer mill, roller mill, impact mill, pin mill, disk mill) until the particle size of the rice flour is consistent. Freeze grinding is a newer method that uses less energy and produces less waste from processing. Rice kernels are frozen using liquid nitrogen and then dry-ground into flour. Freeze-grinding temperatures have been shown to damage starch content in the rice flour. Rice flour is used in food for gluten-intolerant consumers. It’s use in bread-making is still limited because rice proteins are unable to retain the gas produced during the fermentation process. Glutinous rice flour is not the same as rice flour. It can be used in combination with rice flour in gluten-free baking but not as a substitute. Gallagher, E. Gluten-Free Food Science and Technology. Wiley-Blackwell, 2009, p. 79. Zhou, W., and Y. Huri. “5 Rice.” Bakery Products Science and Technology, 2nd ed., Wiley Blackwell, 2014, pp. 103–116. “Rice Flour, White Nutrition Facts & Calories.” Nutrition Data Know What You Eat., nutritiondata.self.com/facts/cereal-grains-and-pasta/5726/2 Accessed on 26 March 2018.